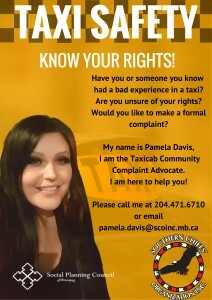 Taxicab Complaint Community Advocate – Southern Chiefs' Organization Inc.
Southern Chiefs’ Organization recognizes a need to address the ongoing concerns from the Indigenous community in Winnipeg regarding safety of Indigenous passengers when utilizing taxicabs. Indigenous and marginalized women and girls in Winnipeg are more susceptible to negative experiences within the Taxicab Industry, and one of the goal as the Taxicab Community Complaint Advocate is to make our women and children feel safe while they utilize the Taxi Service. No one should be made to feel unsafe or taken advantage of because of race, gender or status. Indigenous women in Winnipeg may be more susceptible to negative experiences within the Taxicab Industry. In Manitoba, the Taxicab Board regulates Taxicab Owners and drivers through the Taxicab Act of Manitoba. The Taxicab Board is an independent quasi-judicial administrative tribunal established under authority of The Manitoba Taxicab Act to licence and regulate all taxicabs, wheelchair vans and limousines operating in the City of Winnipeg. All complaints and concerns regarding the operations of Taxicabs must be filed with the Taxicab Board. However, SCO has been aware that many Indigenous peoples either are unaware that the Taxicab Board exists or that complaints are to be filed with the Board. SCO has been working in researching issues of concern to promote changes for the safety of women in Taxicabs. SCO urges individuals to promote their own safety when taking a cab.